I think we are in a “golden age” for coffee in Boston, with the ascendancy of small, quirky and craft-minded coffee shops. When I first moved to town in the late 1980s, there wasn’t much on the scene. It was mostly a sea of over-roasted coffee and meh corporate chains. Now, there’s much choice. Very cool. 3 Little Figs: In Somerville, a quick walk from Porter Square, is this amazing hotspot. Cold-brewed coffee ready to go, an excellent food menu that includes Greek yogurt, prosciutto and egg sandwiches, and baked-on-prem muffins and pastries. MEM Tea. Artsy light fixtures. Perhaps I’m biased because they were playing New Order the first time I was there, and the ensuing time became a Top 10 Day of the Year, but I love the vibe there. George Howell Coffee: He’s back. After selling his Coffee Connection stores to Starbucks and letting his non-compete run its course, Howell has opened a little shop in Newton. He roasts his own coffee and is supplying other shops, such as Crema in Cambridge. Excellent espresso. A unique roasting style, leading to multi-dimensional tones and acidity. Baristas Diana, Jonathan and the others have a delicate touch and are super-nice. 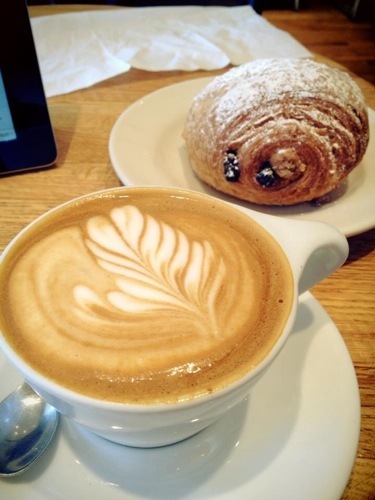 I love their cappuccinos and chocolate croissants (see photo). I’m there almost every day. Best wishes for a wonderful Columbus Day weekend. Hope you’ll be able to enjoy the beautiful fall foliage.